As he makes clear in the book’s title essay, “Egalitarianism as a Revolt Against Nature,” libertarianism rests on the incontrovertible fact that people are different. Procrustean efforts to impose equality are inimical to liberty. This has not prevented egalitarianism from being the dominant ideology of our age. The court intellectuals support it, but they have no arguments to defend their views, which go against human nature. Not only is equality unnatural; it contravenes the division of labor, the most important cause of a productive economy. Rothbard points out in “Freedom, Inequality, Primitivism, and the Division of Labor” that the division of labor depends on differences among people: an economic system based on persons who specialize in producing what they can do best vastly outstrips a society where everyone does the same work. To enforce equality is to ensure a society that can function at only a primitive level. Some leftist intellectuals, bemoaning the “alienation” of the free market, have embraced this consequence. They are, Rothbard holds, the victims of a Romantic myth. Contrary to the views of Karl Polanyi and other proponents of such fantasies, pre-industrial society was no Arcadian Utopia. The free market, based on peaceful cooperation and productive exchange, is the key to a free and prosperous society. What stands in its way? In his classic “Anatomy of the State,” Rothbard answers that the State is a predatory institution derailing the efforts of people to lead their own lives. Precisely the key task of libertarianism is to combat the State’s nefarious activities, in so doing exposing the State as inherently oppressive. In these efforts to combat the State, the battle against egalitarianism, the prime ideology of the State’s court intellectuals, assumes prime importance. In the struggle against the State, Rothbard suggests a concentration of effort. As he points out in “War, Peace, and the State,” war has been the principal means by which the State has extended its power. Libertarians must resolutely favor a strictly defensive foreign policy and must oppose all global crusading. This ought to be our primary focus in political action. 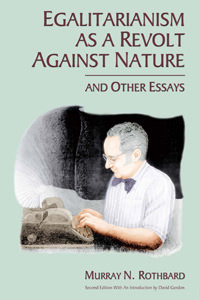 The book contains a wide variety of other essays, all written with Rothbard’s vast knowledge and acute insight. If you want to get a sense of Murray Rothbard as a thinker, this book is a good place to begin. Something is keeping the world from embracing liberty, and that something is ideology.